In light of the recent Oregon mass murders, the gun controllers have yet another ridiculous meme that is easily proven to be untrue. 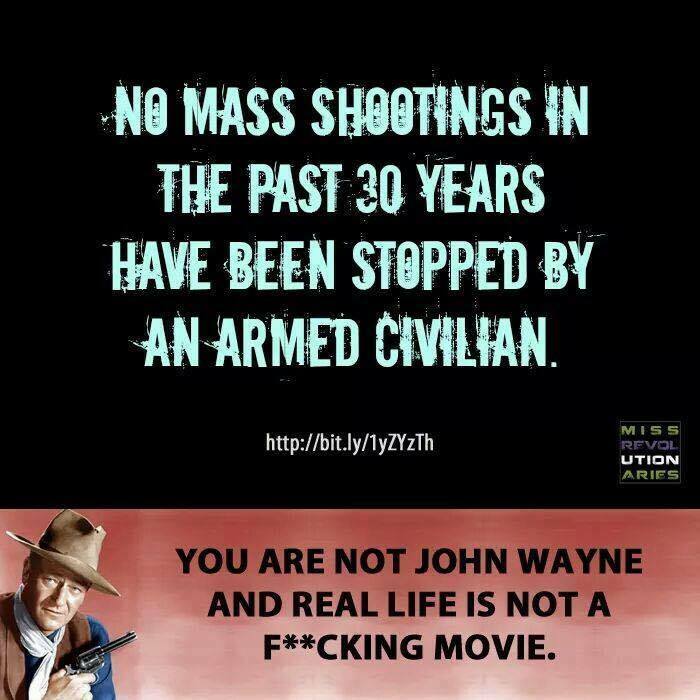 What they also don’t seem to realize is that most, if not all, mass murders of these type, especially those in their beloved ‘gun free zones’, are always stopped by someone with a firearm whether it’s the police or a civilian. Here are just a few cases below that prove they are wrong. August 30, 2010When a 62-year-old man armed with two handguns forced his way into Sullivan Central High School in Tennessee, he was immediately engaged by School Resource Officer Carolyn Gudger. Gudger put her body between the gunman and a student and started what would turn out to be a more than 10 minute gun-to-gun encounter. Gudger used the time to slowly move the man to a less crowded part of the school. When other officers arrived on the scene, a brief gun battle erupted ending with the gunman mortally wounded. Dec. 9, 20072 parishioners were killed and 3 wounded when a gunman toting a Bushmaster AR-15 opened fire at New Hope Church. Hearing the rifle fire, Jeanne Assam grabbed her personal concealed carry firearm and confronted the gunman from a distance of 20 yards. Dec. 11, 2012Two people were killed and a third was seriously wounded at Clackamas Town Center near Portland, Oregon when a rifle-toting gunman opened fire in in the busy food court. Nick Meli, a shopper in the mall, drew a personally owned firearm on the gunman, who immediately retreated to a service corridor and killed himself. Meli did not fire his weapon for fear of striking bystanders yet authorities say his actions caused the gunman to cease his attack and end his own life. April 30, 2014An irate former employee came to a construction site and opened fire on his co-workers. The site’s foreman, a Concealed Handgun License holder, drew his firearm and opened fire. Both men were wounded in the exchange of gunfire but the foreman’s actions ended the attack and no one else was wounded. Of course, you rarely get big headlines when these cases happen because the main stream media is typically left wing and are all about gun control for the masses. While these hoplophobes continue to push more gun control that gets people killed, Americans know that their odds are much better if they can protect themselves than wait for the good guys with guns. Seconds matter when help is minutes away.